The best little 10-watt station ever? Fans of WYPR ("Your NPR News Station") are familiar with its home at 88.1 on the FM band. But way before WYPR and its professional staff took over its bandwidth in 2002, 88.1 FM was the home of Johns Hopkins University's student- and community volunteer-run WJHU radio station. I should know. 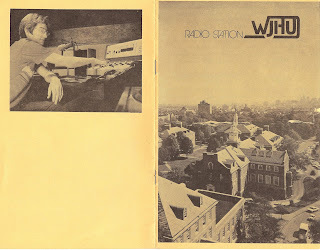 I was one of the countless "volunteers" - many of whom were Towson State radio rejects - who, though not affiliated in any way with the University, got an FCC third-class operator's license so that we could be disc jockeys on what was then a 10-watt station. I emphasis the lo-fi power because years later I worked with a woman, Jan Janes, whose husband had a show on WJHU and he loved the fact that he called his jazz show "The Voice of America" - on a station that couldn't be heard outside a 5-mile radius! 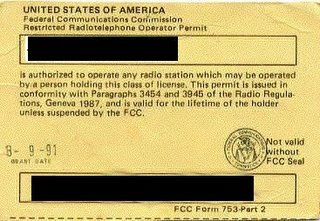 Getting a radio operator's license back then meant taking a test that taught you how to check a bunch of knobs and sending in a check to the FCC. Oh, and learning the art of cueing up records and periodically speaking into the microphone without over-modulating. Jocks also were taught how to jam clunky "promo-carts" (8-track cartridges with pre-recorded public service ads and station IDs - I remember favoring the one that had David Byrne doing a station ID in that awkward, low-key way of his) into a slot every half-hour or so - it was very important to identify the station ("You're listening to WJHU, 88.1 FM, Baltimore") in between songs. I also learned that when you wanted a smoke break or needed to use the bathroom, you spontaneously announced, "And now it's time for 'Deep Cuts' as we treat you to an entire Album Side!" Programming is made of such impromptu decisions! "And now it's time for 'Deep Cuts' album sides!" My Brilliant Career, or: Hang the DJ! I believe it was my friend and City Paper colleague Michael Yockel who got me in at WJHU, where he already had a great '60s retro-rock program called "Vintage Vinyl" on Monday nights at 7 p.m. Yockel's show was a goldmine for hearing "regressive rock" Nuggets, Garage, British Invasion, and what later came to be known as "Freakbeat." It rocked. I still recall a great set in which he played the Turtles, Beau Brummels, and early Rolling Stones, ending with Dylan's "Desolation Row." It has stayed in my otherwise overdrawn Memory Bank. Michael Yockel hosted "Vintage Vinyl"
My then-girlfriend (later wife) Katie "Katatonic" Glancy (we were former members of Thee Katatonix with free time on our hands, as we had not yet joined The Boatniks) and I soon had a late-night Punk/New Wave show called "We Am a DJ" (our theme song was David Bowie's "I Am a DJ"), but, after Katie lost interest, I soldiered on with another eclectic rock show called "Make Believe Ballroom" (yes, the theme was Glen Miller's song of the same name). Later I recall renaming my show "Tubas in the Moonlight," after the Bonzo Dog Band song. 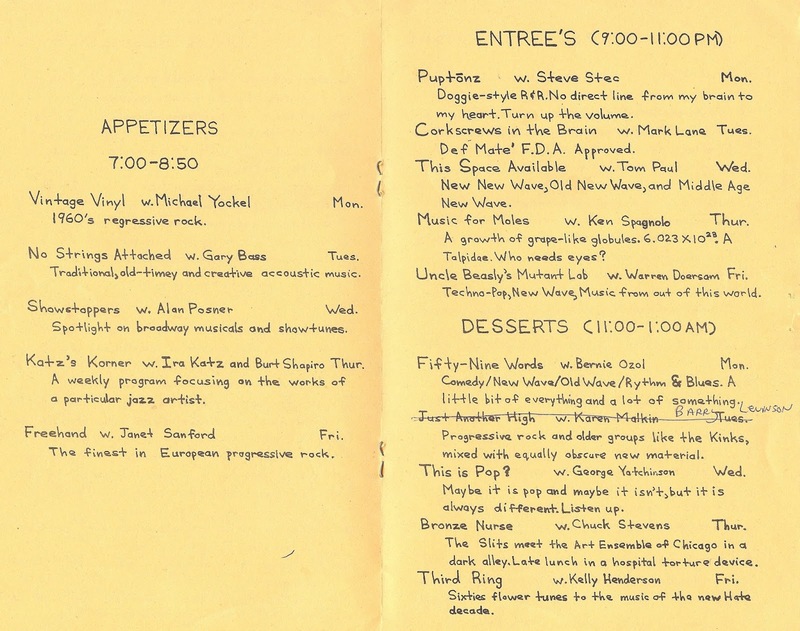 This would have been around 1981 ("We Am a DJ") and 1982 ("Make Believe Ballroom," "Tubas in the Moonlight"). I remember two highlights in my short-lived amateur career at WJHU. One was airing a "mashup" (before it was even a term!) 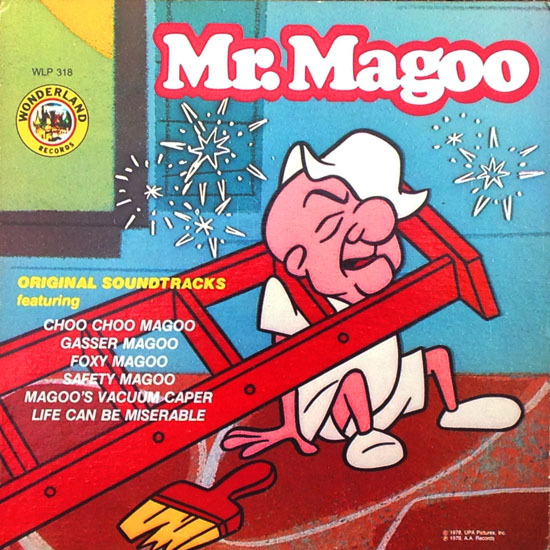 of a Mr. Magoo children's record (featuring dialogue from the cartoon series The Mr. Magoo Show) played over the Simple Minds's instrumental song "Theme for Great Cities." It sounded great, and I recall getting a phone call at the station from someone who wanted to know where he could buy it! The caller was devastated when I told him it was a creation of two turntables and a microphone. The other highlight was the night Katie and I interviewed and played music by the late-great local band Boy Meets Girl (guitarists Ceil Strakna and Tom McNickle, bassist Ira Kessler, and drummer Vicki Ruth - check out their Facebook page!). The interview was a Comedy of Errors as I was unable to get the intercom working between the radio booth (where I was) and the interview room on the other side of the window (where the band was). I kept having to talk, then switch off to hear them, then back again. High jinks ensued. But at least their demo tape got played. BMG were our favorite local band and great friends, to boot. 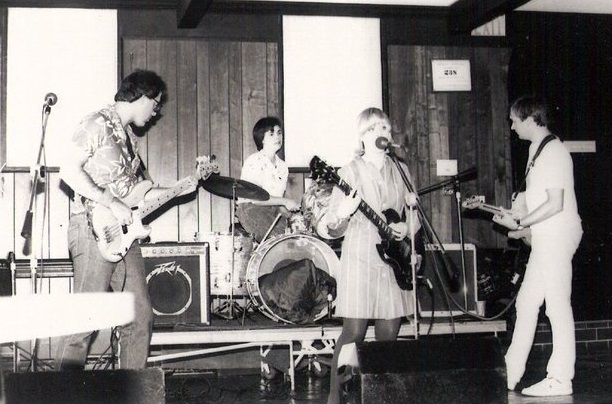 Their garage pop music was phenomenal, as the band was blessed with two outstanding songwriters, Tom McNickle penning classics like "You Better Look Both Ways (Before You Cross the Street To My Love)" and Ceil coming up with the pop-perfect "I'm the Girl With the X-Ray Vision" ("I can see right through your lies"). And they both had a knack for timeless cover material, like Johnny Cash's "Jackson." 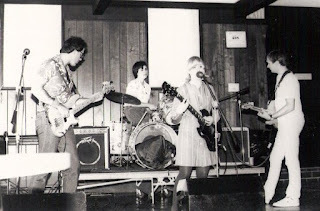 (Tom Boynton later replaced Tom McNickle on lead guitar and bassist Ira Kessler went on to join the band Elements of Design with Joe Manfre, Rose Wampler and Julie Smith.) 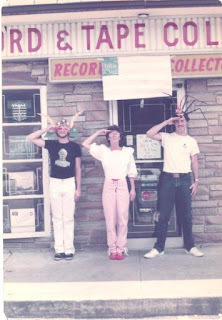 Check out some vintage BMG songs at ReverbNation.com. Sadly, a UK band also called "Boy Meets Girl" (a duo consisting of keyboardist and vocalist George Merrill and singer Shannon Rubicam) appropriated the name from across the pond in the mid-80s; these pretenders to the throne are best known for writing two number one hits for Whitney Houston: "How Will I Know" and "I Wanna Dance with Somebody (Who Loves Me)." I wasn't a very good DJ - for one thing, I hated talking! - but I learned the knack of doing good segues (fading records in and out), and I loved exploring the WJHU Record Library. 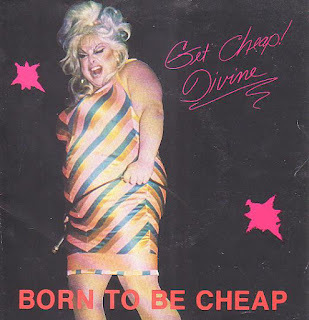 I found obscure Punk and New Wave records there (this was the early '80s, after all, when this stuff was relatively new) that to this day are still hard-to-find. 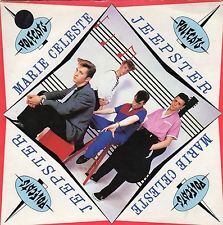 One was a 12-inch by the Scottish band Altered Images that featured Clare Grogan's delightfully chirpy cover of Marc Bolan's "Jeepster" (for decades it was unavailable on CD, until I finally found it!). 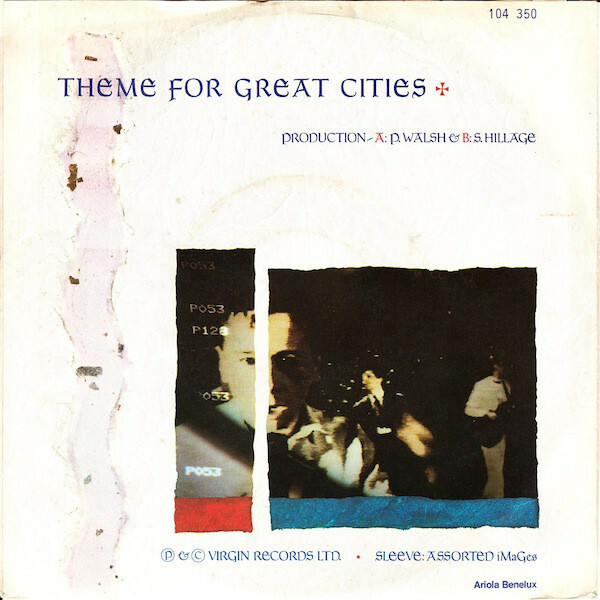 Sometimes I think I was the only person who loved this group; many found Clare Grogan's baby-talk vocals grating, but I had adored her ever since seeing her film debut in Bill Forsythe's Gregory's Girl (1981). And Young Marble Giants were a revelation to me (good luck finding this Welsh group's debut album!) And I discovered I loved XTC's back catalog thanks to George Yatchinson and his New Wave show "This Is Pop." Unfortunately, the library collection started to disappear over the years. I'm pretty sure one of the later DJs was pilfering choice vinyl. 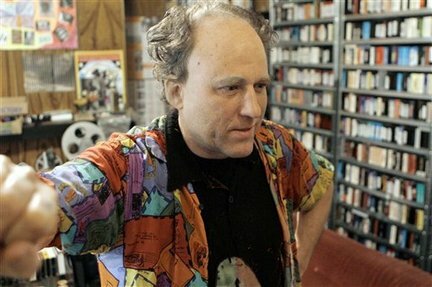 Whenever I was in a used record store and spotted an album with the WJHU imprint on it, I wondered if it was one of his thefts. "I tried so hard to keep that collection together," says Barry Caplan, a Hopkins alumni who worked at the station during this era. "At least as best I could at 20 years old. I wanted Eisenhower library to have it." 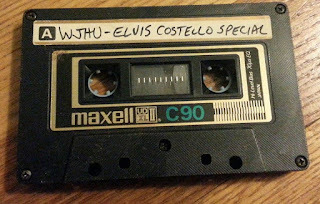 I recently found a tape from one of my shows from June 1982, and it reminded me of the eclectic kind of music that was the night shift format at WJHU. Novelty tunes ("The Ballad of Lady Di," excerpts from the "Eraserhead" soundtrack, Divine singing "Born To Be Cheap" and "The Name Game") alternated with current Punk and New Wave faves (The Cure, Lene Lovitch, Buzzcocks, Wayne County, B-52's, Flock of Seagulls, Richard Hell). 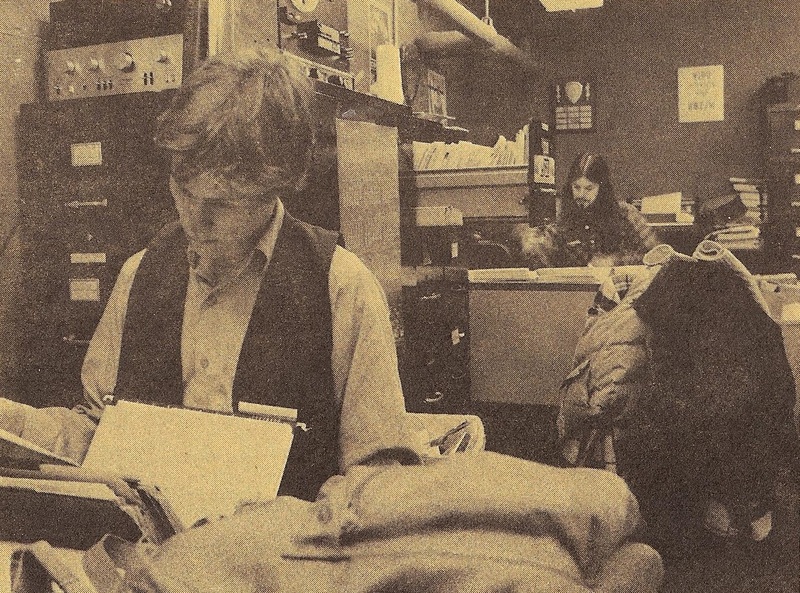 At the request of students, the Hopkins administration applied for a power boost to protect the station's frequency when the FCC deregulated low-watt FM stations in the 1980s. 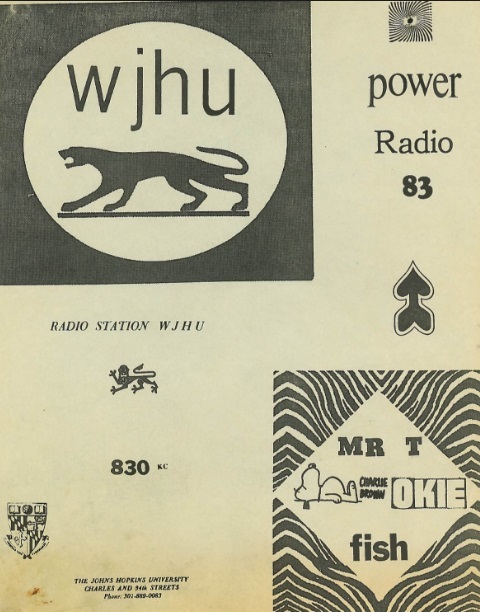 In 1982, the FCC approved the university's application for a 25,000-watt license, which would extend WJHU's reach throughout the Baltimore and Washington, D.C. areas. At the time, this was the largest radio station increase in history. But in the spring of 1983, the station was forced off the air due to the renovation of the building where the studio was stationed: Alumni Memorial Residence (AMR) II. 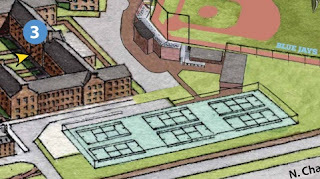 This building was right behind the tennis courts that line the campus just off Charles Street. 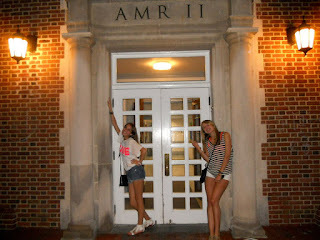 AMR II Today: Alas, we had no groupies waiting for us outside the studios back in the day! In November 1984, students constructed make-shift studios in AMR II. Students had been reassured by University officials that the new high-power station would continue to be student- and community-run. But by the time the station returned to the air in February of 1985, the University hired a professional general manager and announced the creation of a new $1 million-dollar professional radio station on North Charles Street. The format shifted towards classical and talk radio. 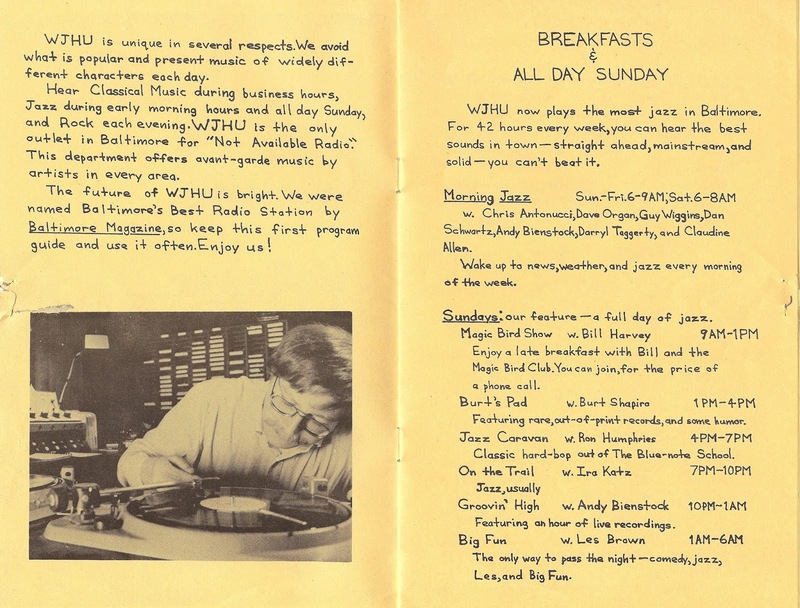 WJHU tried to take on WBJC in a battle for classical music lovers, but admitted defeat by 1995 as it moved toward talk and news radio. The University sold the station to Your Public Radio Corp., the organization that runs WYPR, in 2002. 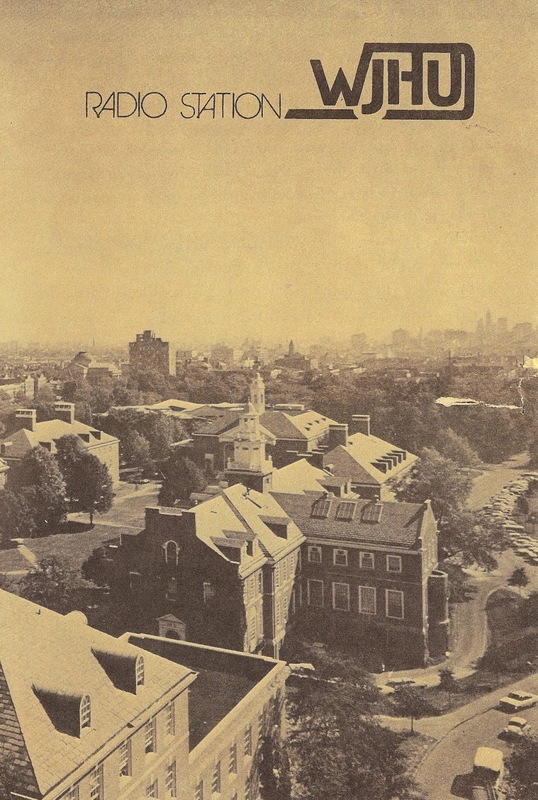 As JHU alumni Mark G. Margolis (Arts & Sciences, 1985) complained in a letter to the Johns Hopkins News-Letter, "Students never had the opportunity to run the high-power station. 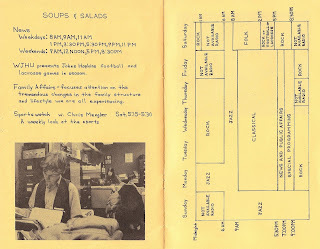 Student radio remained dead until it was resurrected by WHAT/WHRS." 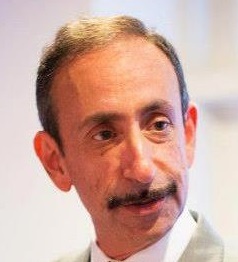 Margolis went on to attribute WJHU's transition from a student-run station to a professional operation to economics. "The University had been subsidizing the operation, and decided they weren't getting a return on their investment." At the time, JHU was a wonderful community station. It was only something like one watt so it didn't broadcast very far. It wasn't long before ONE paid employee was brought in from out-of-state & all the community DJs were let go. The humorless DJ stayed on & continued on to JHU's replacement after the station was done away with altogether. He's been a jazz DJ for decades now. I wonder how many people realize what a sell-out he really is. Ouch! I'm pretty sure tENT was referring to Andy Bienstock, who still works at WYPR, where he is a programming director and on-air personality. I always liked Andy. Besides hosting a great jazz show, Andy is, like me, a Sinatraphile, and I learned a lot from listening to his Sinatra shows. tENT found a fellow rebel radio spirit in Ron Cummings. "Ron Cummings was probably the most innovative of the radio people that I ever collaborated with. We shared a preference for expanding what could be done on the radio into territories most people would've never thought of or considered. Ron would run reel-to-reel tape loops in the studio by having them stretching over various objects like a spider-web in the room. He had an extremely sardonic sense of humor." 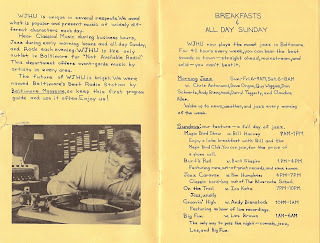 I'd been invited by WJHU DJ Steve Stec (see the "Radio 1979" notes) to do a piece for his "Pop Tones" radio program & an article entitled "'Tentatively' speaking, 'mad scientist' takes to the radio" appeared in the Baltimore Sun the morning of the day of the program. The piece I made for the show was called "PAUSE FOR (Radio Play Only)" & consisted of just that: station IDs from whatever radio stations I could receive in my apartment in South BalTimOre separated by 'silence'. 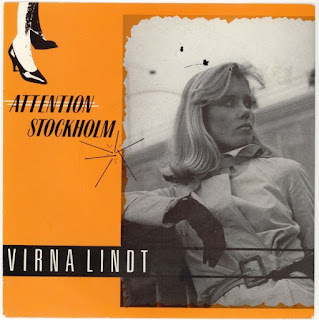 The idea was that listeners would see the newspaper publicity, try to tune into the program & only hear static & station IDs from other stations. They would then think that they'd tuned into the wrong station & try to find the right one. Their unintentional participation in the program's content, their tuning of the radios, would then become the actual content of the program. It was to be my way of tricking them into participating by using their radio as an instrument. When I arrived at the station, a very irate station manager accosted me & Steve. The article had been read by JHU personnel & they were alarmed as to what I might do. I had deliberately left my plans mysterious in my interview for the article. When I was asked by reporter Robert M. Green "Is it obscene" I replied to the effect of "Well, if it's obscene, it's obscene in the way radio is always obscene" by which I meant that one could say that the commercialism of radio is obscene. I surreptitiously recorded my interaction with Steve & the station manager - who demanded to have the tape so that he & a panel of concerned JHU censors could listen to it. They were completely confused by what they heard & were initially unconvinced that this was my 'real' tape. I think what they expected was something like 'Kill the Pigs!' - something rather unlikely to be coming from me. After listening to the tape, the station's lawyer was called & he vetoed the playing of it. Steve was then suspended from the station for 2 weeks for inviting me on without asking for permission from the station administration 1st. Of course, it was NOT station policy that such permission was required & guests came on all the time without it. In fact, I doubt that ANYONE had ever been required to ask for permission before. This 'rule' was made up specifically to exclude me. Track 2 here is of that clandestine recording & Track 3 is of the actual "PAUSE FOR (Radio Play Only)" program. While the piece was prevented from airing on its intended premier date, a version of it that included an excerpt from the secret tape was published by banned Productions in LA & THAT version DID eventually receive airplay somewhere. 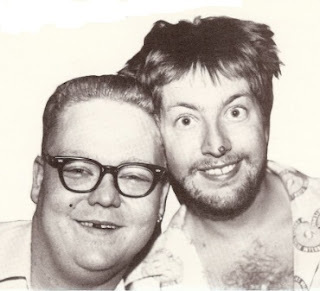 Around this time, I was lovers with one JHU DJ & became friends with another one: Ron Cummings (aka RAN of NAR). RAN & I had similar interest in stretching the boundaries of what people would listen to. It was probably sometime in July that I proposed to my lover & to RAN that we drive from WJHU (88.1FM) to the radio station of the University of Maryland, WMUC (88.1FM), a drive of approximately 45 minutes away, & that we keep the car's radio on 88.1 & record whatever was played on the radio between the 2 stations. I'd originally wanted to do this as a cross country trip. The idea was to have the continuity of the frequency with the discontinuity of whatever radio stations could be picked up on it on the journey. On the initial drive down either the radio got slightly detuned &/or we got slightly lost so the end station of the trip was WAMU instead of WMUC. We then went to MUC where we explained our project to the DJ on the air at the time & turned around to come back. Track 3 begins with his allusions to us. By the end of July, RAN proposed that he present a NINE HOUR program of my material. This was extraordinary of him & hadn't happened before or happened since. More or less all of my recordings of the time were extremely different from what most people expected from 'music' - which was why RAN liked them. RAN went to great lengths to make this program even more unusual by making special cartridges from the TESTES-3 material (see "Radio 1979") & by processing the other tapes he played. The excerpt here (broken into Tracks 6 & 7) is from 2:40 to 4:15AM & has material from a "Lacquerland" performance (a performance by myself & my collaborator Herr Brain) while getting high from brushing lacquer on at our hard-wood floor finisher job. 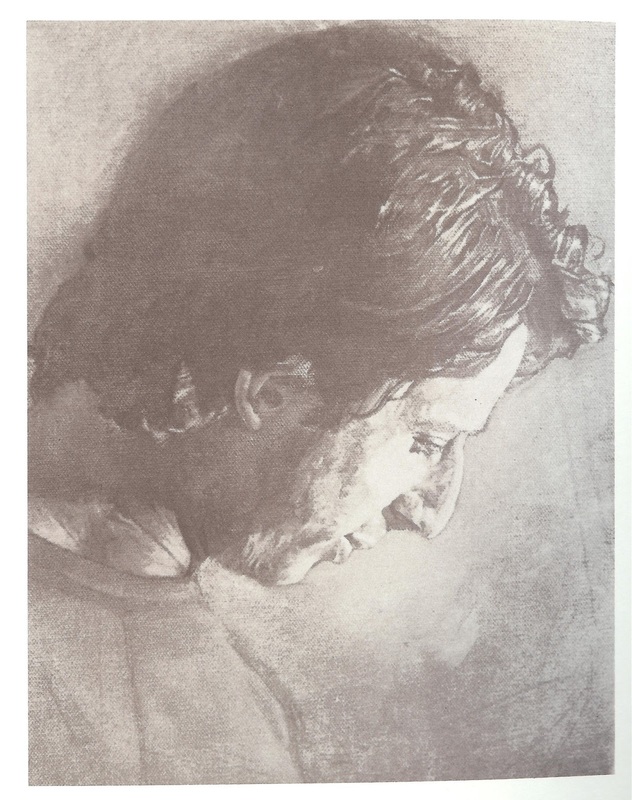 The other piece presented is realizations of my 1976 "dadadadadadadadadadadadadadadadadadadadadadadadadadadadadadadadadadada". Ron/RAN also collaborated with tENT on his infamous "Poop & Pee Dog Copyright Violation" performance in a Baltimore railroad tunnel (see my post "His Name Is Not Legend" for details). tENT's arrest and subsequent international notoriety resulting from this event led to the end of his affiliation with the radio station. RAN was my collaborator on that. I was a member of JHU at the time. RAN & others at the station were amused by the idiocy of the 'news' 'reportage' & put a foto of me performing the 'ceremony' on some copies of JHU's program schedule. Track 8 is one of RAN's shows done at the time in which he plays a recording that he'd done with the dead dogs that I'd found in the tunnel - amongst other things. Shortly thereafter, I was "involuntarily quit" from the radio station at the instigation of one of the more humorless DJs. 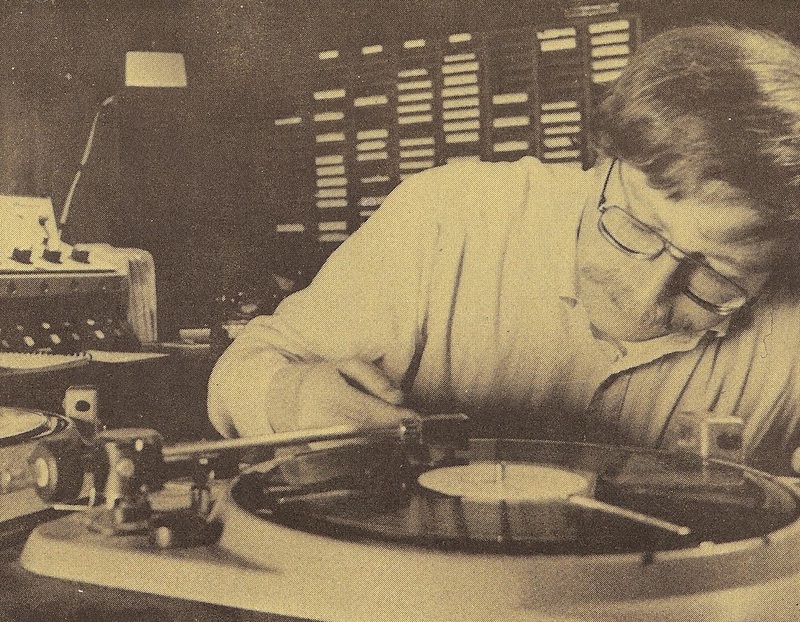 There were so many cool DJs at WJHU, and so many great, eclectic music shows. 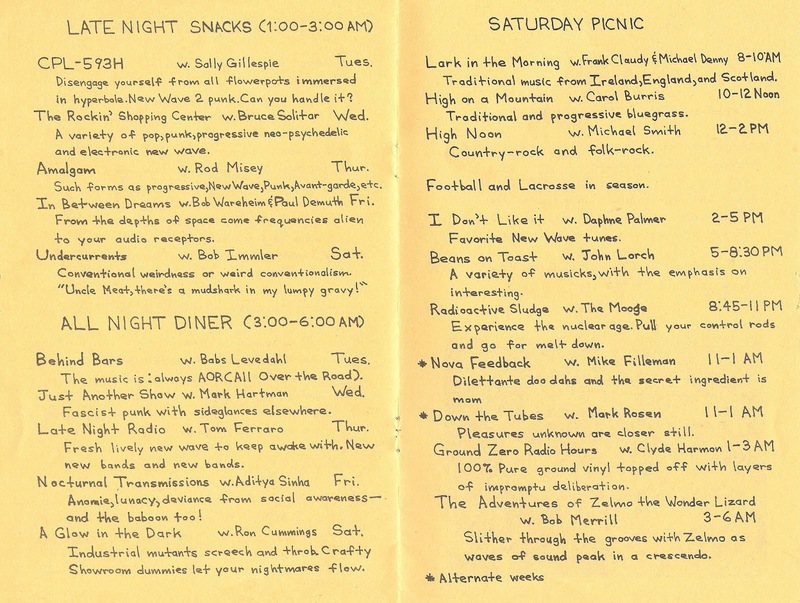 Some of my favorites from this period include: Sally Gillespie ("CPL-593H"), Mark Harp ("The World According To Harp"), Michael Yockel ("Vintage Vinyl"), Tom Paul ("This Space Available"), Ron Misey ("Amalgam"), Barry Caplan ("Pickled Hearing"), John Lorch ("Beans on Toast"), Bernie Ozol ("59 Words"), George Yatchinson ("This Is Pop? 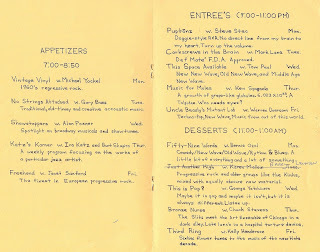 "), Chuck Stevens ("Bronze Nurse"), Bill Stevenson, Marc Rosen (host of "Down the Tubes" and "Radioactivity," and DJ brother of videographer Ed Rosen, aka "Lizard") and Andy Bienstock. Sally Gillespie was one of the few female jocks (other than Katie Glancy) I remember at the station. 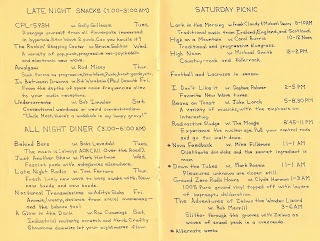 (Though looking at an old program guide, there were quite a few: Carol Burris, Daphne Palmer, Janet Sanford, Michele Weiss.) She loved Bowie and Bauhaus and was a Ziggy Stardust lookalike with her natural red hair, which was always worn short and closely cropped. I think all the boys there had a crush on her because she was, well, Bowie-cool and hip. By day she worked at Record & Tape Collector, but at night (Tuesdays?) she hosted "CPL-593H" (Bryan Ferry's automobile license plate number, referenced in the chorus of the Roxy Music song "Re-Make/Re-Model"), which the WJHU program guide described thusly: "Disengage yourself from all flowerpots immersed in hyperbole. 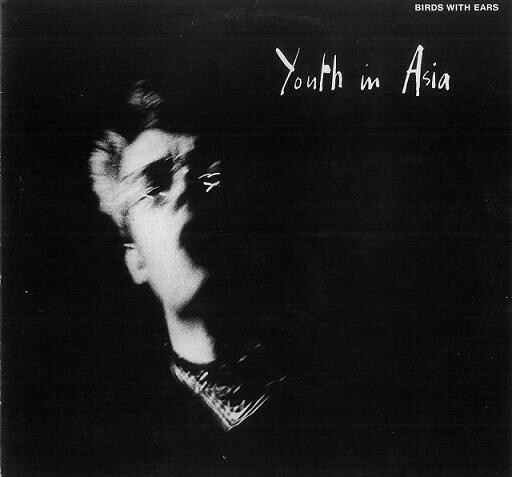 New Wave 2 punk. Can you handle it?" 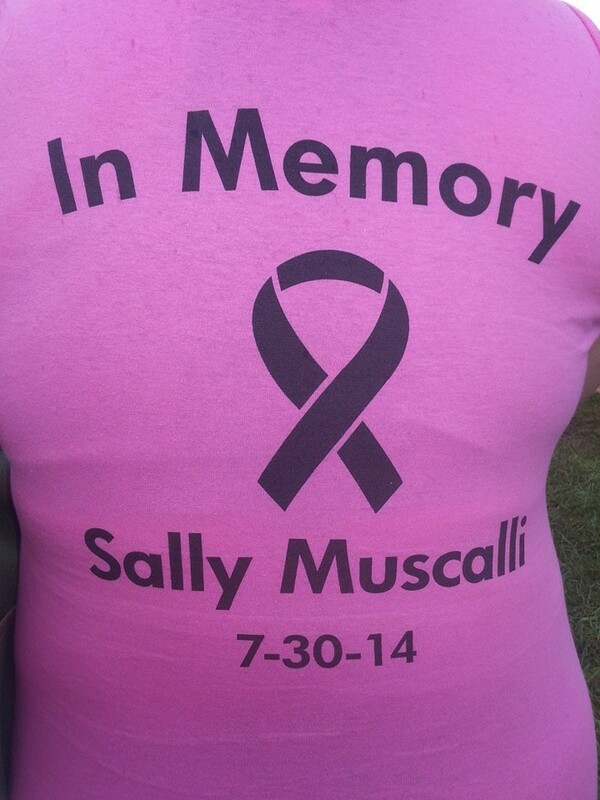 Sally's later married name was Muscalli, which begat her Facebook handle of "Muscalli Sally." Sadly, Sally passed away after a long fight with cancer in July 2014. But while she lived, she never lost her love for rock 'n' roll. "I met Mark when I was 17, a freshman in college. 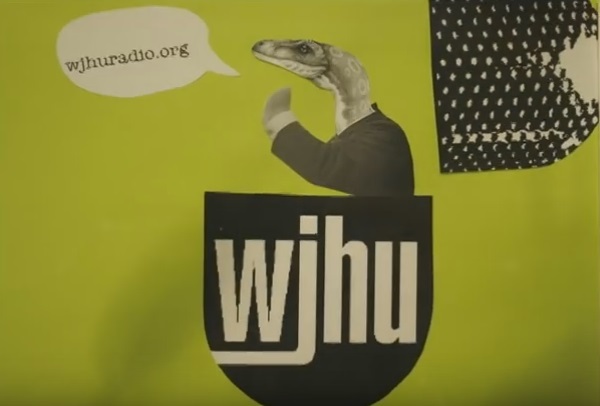 The campus radio station, WJHU, had a marvelously liberal policy regarding on-air staff: you didn't have to be a student, or even affiliated with the university at all! 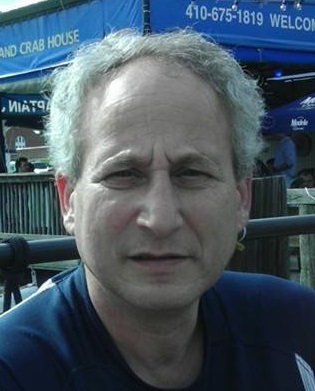 Mark was a so-called "community member" of the radio station. I got to know him when I graduated from the 3-6 AM timeslot into 1-3 AM; he came on after me. He scared me a bit at first, because he was a big, ugly guy. But he was incredibly friendly and his enthusiasm for music was unbounded. Every week he brought a mind-blowing case of records into the studio with him, and I would often stick around for an hour or two just to hear them, and what he did with them. 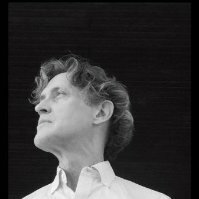 Mark's ecumenical taste in music opened my eyes to so much that I had ignored until then, so he is probably more responsible than anyone else for broadening my own musical world." 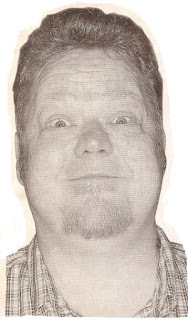 Mark was also a musician in countless bands (Null Set, Casio Cowboys, et al) and would often play tapes of whatever crazy sounds he and his friends, especially Casio Cowboy cohort Chris Dennstaedt, were churning out at the moment. 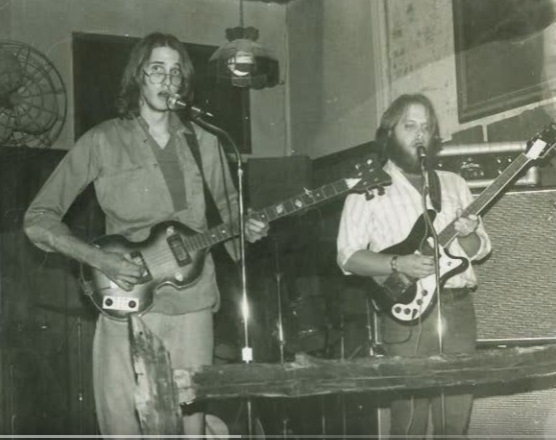 Mark and Chris also would play live in the studio, bringing in their Casio keyboards to perform (and record live) such bits as "Postcard From Jesus," in which the two pretended to be Christian radio evangelists. 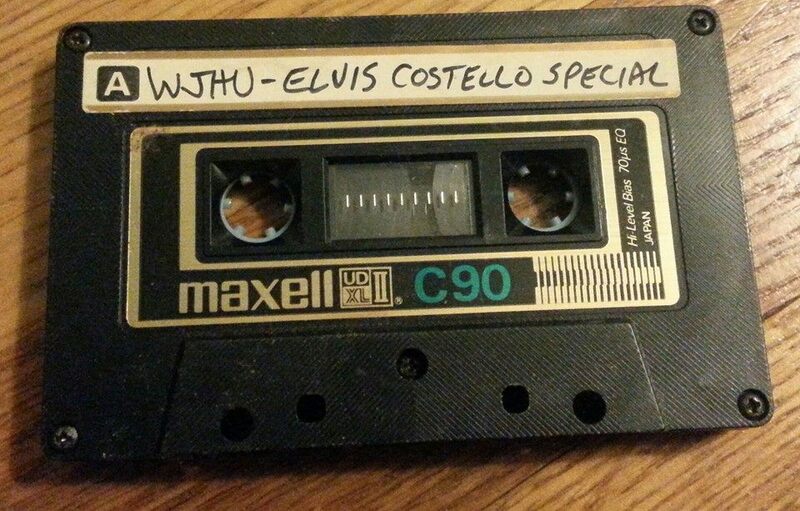 My wife Amy Linthicum, who was then dating Mark (they later married), was an Elvis Costello fanatic and recalls that Mark once did an all-Elvis show in 1983. But unless Mark played her taped broadcasts, she rarely stayed up for his program, which was usually in the wee small hours of the morning. 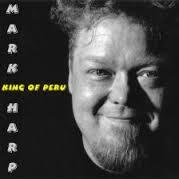 We recently dug out one of his "World According To Harp" tapes and were amazed at the sophistication of Mark's audio manipulations - even back then he was making tape loops and playing around with sampling (repeating beats and sound bites from ABC and Yaz, two of his then-favorite bands), techniques he would refine further as digital technology became available in the 1990s. 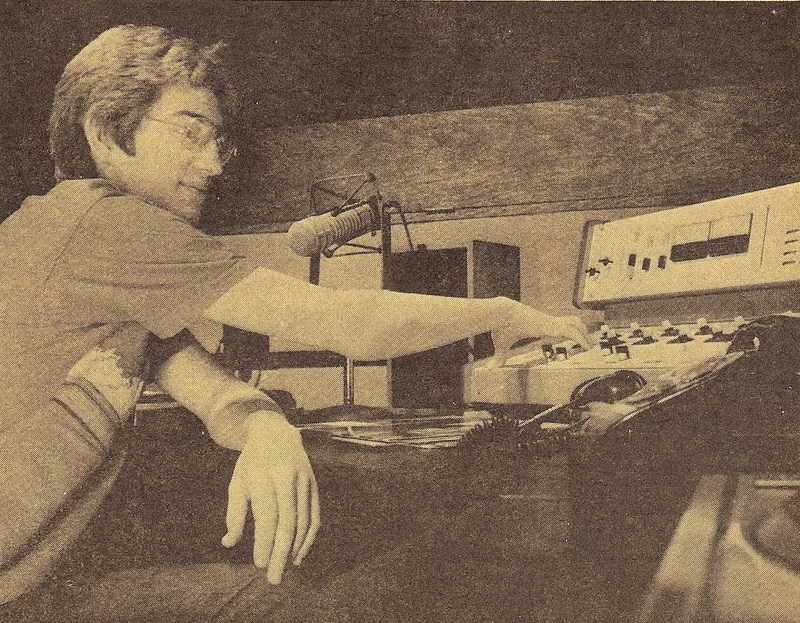 Mark was hardly the lone musician with a radio show at WJHU. Bernie Ozol was a bass player with The Rockheads (formerly "The Silver Rockheads," a nod to the original "Silver" Beatles) and, later, Big As a House, The Retrievers and the DelMarVas. 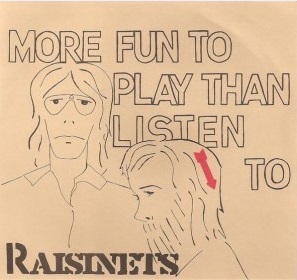 And then there was Chuck Stevens (aka "Chuck Goober") who, along with Bob Greenberg (aka "Blind Meat Tasty" and "Bobo Golem Bobogolem Soylent-Greenberg") made up the demented duo The Raisinets. Chuck hosted a show called "The Bronze Nurse," which the WJHU program guide called "The Slits meet the Art Ensemble of Chicago in a dark alley. Late lunch in a hospital torture device." It was also more fun to play "More Fun To Play" on the radio, and it sure got its share of airplay on WJHU. I was partial to "Mister Sister," but fangirl Kyle Powers recalled the staying power of "What Man." "When I was the coolest eldest sibling, one of our few prized possessions was the Raisinets's 'What Man' 45. All vied for my favor to access it. Made a permanent good impression on the Powers family!" 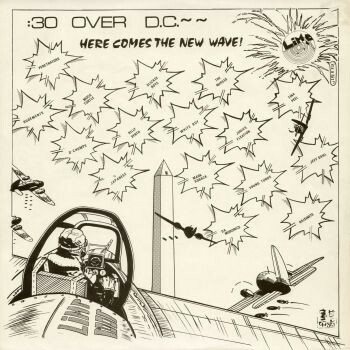 The Raisinets also had their song "Stay Limp" appear on :30 Seconds Over D.C., a 1978 Limp Records compilation of D.C. and Baltimore Bands. 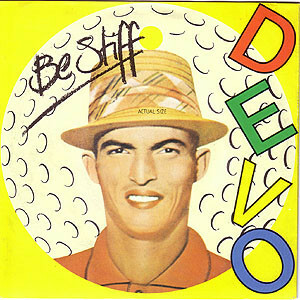 "Stay Limp" was sort of an answer song - and record label shout-out - to Devo's "Be Stiff" single on Stiff Records. It made for an irresistible back-to-back segue on radio, one I certainly couldn't resist. 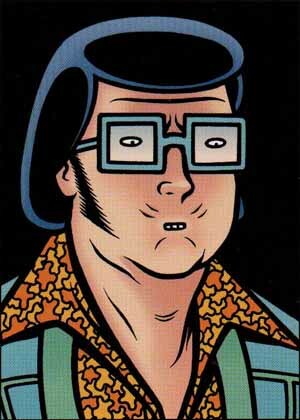 I always wondered what happened to the What Man, Chuck Stevens. He seems to have disappeared online, whereas his chocolate-covered cohort Bob Greenberg is all over the Internets (CD Baby, Reverb Nation, Funny or Die, Etsy), where he has rebranded himself Bobo Golem Bobogolem Soylent-Greenberg and lists himself as a "La$ Vega$ $treet Performer." Others have disappeared, permanently. Besides the tragically too-soon passings of Sally Gillespie and Mark Harp, the past year saw WJHU lose its beloved office manager. 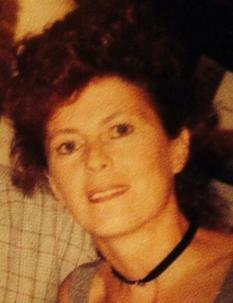 Before becoming the school's only paid employee at WJHU, Irene spent time working at WBAL radio. I'm not sure how she came to WJHU from there, but it was the ideal job for her and she was the ideal person for the job. Not only was she unflappable, but she understood perfectly how to allow each of us just the right amount of space to grow, spread our wings and fly from the nest. How far and wide we have all gone on that foundation is a, tribute to her. 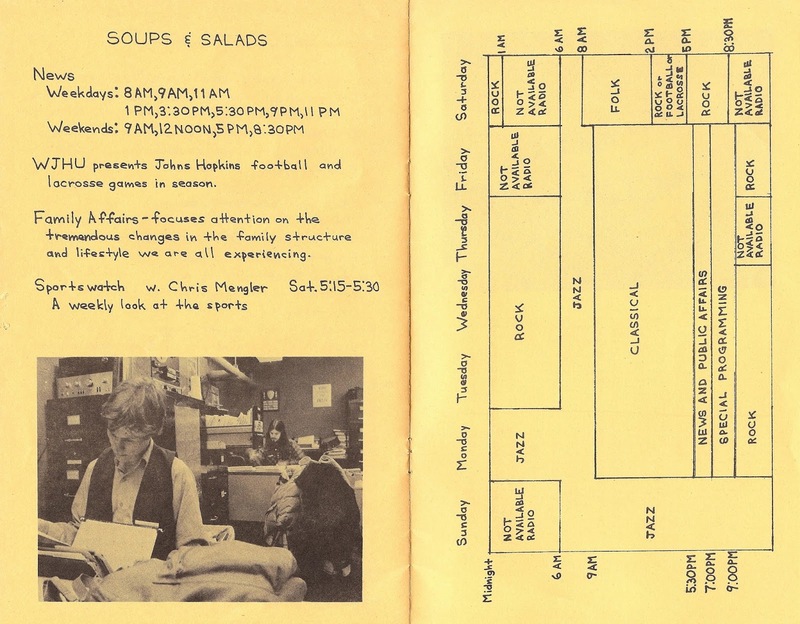 After WJHU was shut down, Irene worked at the then-new Instructional TV unit at Hopkins. There were students there, but it wasn't the same she once told me. It was a promotion for her, but students weren't really in charge of anything and she missed that aspect of her work a lot. Her work became a job. WJHU was never a job, it was a labor of love that she was paid for. I think we are all older now than Irene was at WJHU. For an unfairly long time, fate dealt Irene a very difficult blow, and I hope that her memories at the radio station, her role in shaping all of us, a little, or a lot, that she made for herself were hers to keep and comfort her. And that's all I've got for reminiscences. I welcome feedback - and, no doubt, corrections to my faulty recollections -from those who remember the heydays of WJHU in the 1980s. At WQHS (UPenn, carrier current to the dorms) our bathroom break track was the long version of The The's "Uncertain Smile". 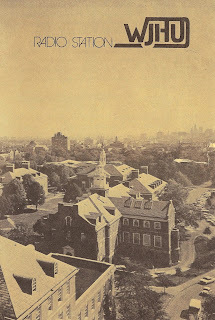 QHS (stood for Quad, Hill House, Superblock, all dorms @ UPenn) had no news department. We had to backtime songs to end on the hour, and then remember to call Mutual News and patch the telephone line in. Penn's real radio station was and is WXPN. Back in the day if you did real well at QHS, you might be invited up there to shine the shoes of the actual (and mostly paid) on-air staff. My time slot was usually 12-4 am, 'nuff said. Excellent post! (Our mutual friend Bump clued me in to it). I'm Dan Nigrin, I DJ'd at the student run WJHU in the '84-'85 timeframe, initially starting over one summer on a graveyard Wed night 3am-6am shift. Show called "Theoretically Sound." I remember working with several people you mentioned, including Mark Harp, JD Considine, and Bill Barnett. In addition, there was Sue Trowbridge and Larry Shanet and probably a few others I'm forgetting. WJHU was a great little station, and opened up my musical boundaries to no end. It directly resulted me in getting into club DJ'ing - I went on to spin at some of Baltimore's best clubs at the time, including Cignel, The Depot, The Rev, Orpheus, PowerCore, etc...), and in turn Bump and I went on to form our band Glitch, and eventually creation of our label Defective Records which put out over 30 releases. One person not mentioned in this post is Ira Hankin, another community DJ who was at WJHU in the early 80s. 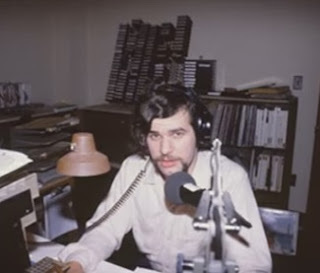 He later moved to San Francisco and did a tribute to Mark Harp on his KUSF radio show. Not sure where he is now. George Yatchisin's name was misspelled in this article so I thought I'd mention him here in case he has a Google alert on his name. (I will admit that's how I found this post!) I believe he's now a journalist. 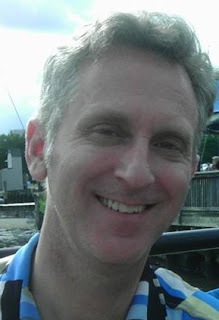 He was a grad student at JHU when I was an undergrad and I think he roomed with Bill Barnett at the time. Excellent article. Tommy Paul dragged me down to the station, made me get my FCC license, and introduced me to Sue Trowbridge, who eventually gave me a spot for a show. Since I John Lorch was my roomate, I called the show "Radio Free Pigtown", since we lived down on Herkimer street. I often followed Mark Harp or JD Considine, and often did the news with Tommy Paul (who did become a Batimore cop, as you mentioned...but then again, so did I!) 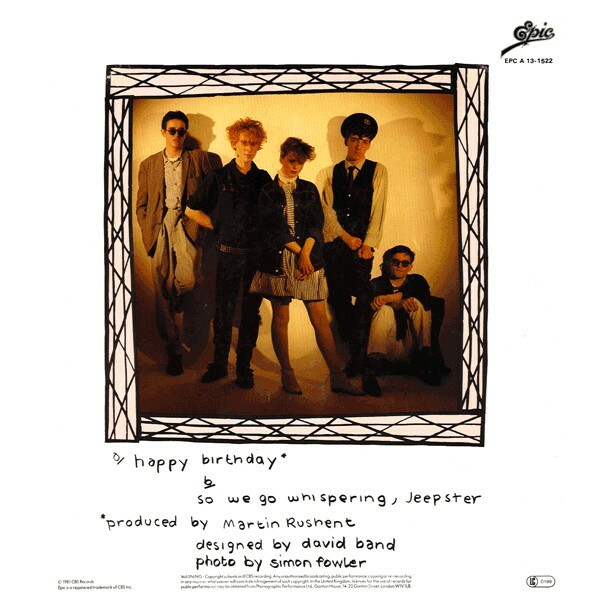 BTW, I have played that exact "Happy Birthday" single by Altered Images". I loved Claire, too, lol. Thank you for the trip down memory lane. Very cool. 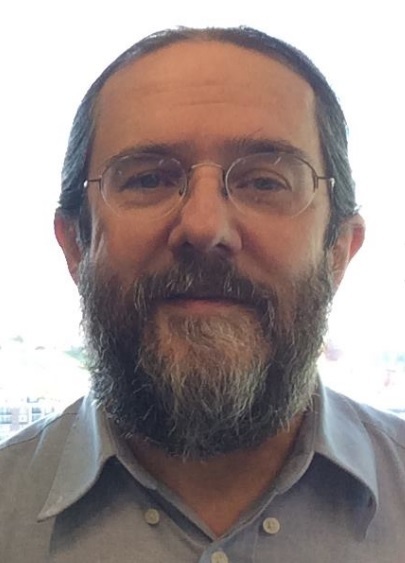 Chuck Stephens became a widely-published film critic. He has since retired from that ignominious profession and lives in happy obscurity in Los Angeles.